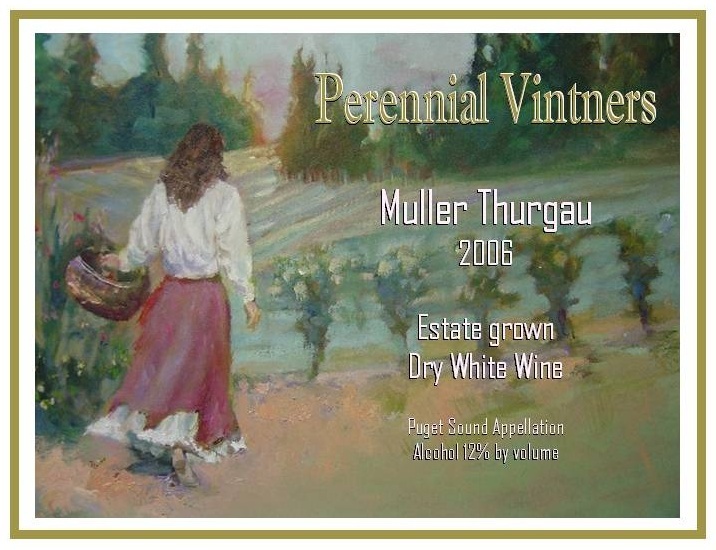 This is our second release of our Estate Müller Thurgau, vintage 2006! Our family hand maintains a half acre block of vines originally planted in 1981 by our neighbors at Bainbridge Island Vineyard & Winery. From this block we've harvested about a ton of grapes, yielding 58 cases of wine. We brought in the 2006 harvest with excellent numbers and clean bright flavors. It is a dry white wine, and is an excellent accompaniment to most fish and other seafoods; it especially shines with Mike's specialty Dill-Caper Chicken. This wine was not intended to be aged -- please enjoy it young, while its fresh fruit aromatics are at their peak. This wine label features a commissioned artwork. Please visit our page with more information about Dianne Gardner of Port Orchard and her work.